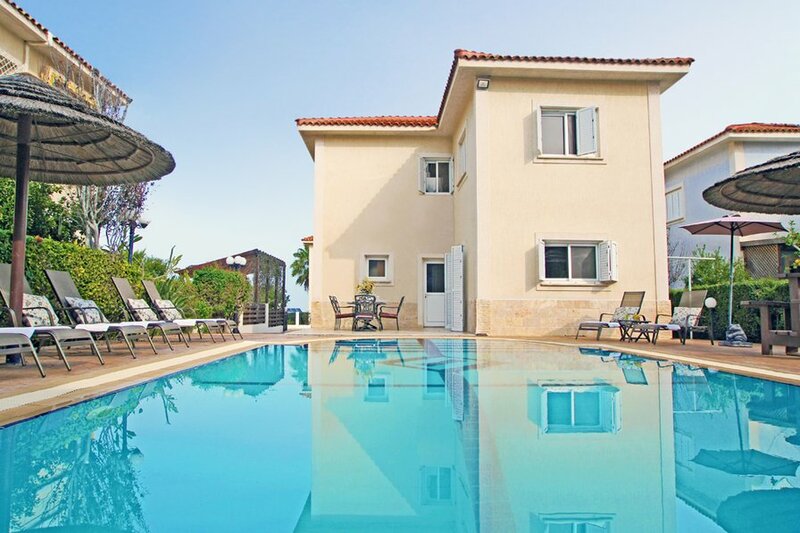 Four bedroom villa in fig tree bay in Protaras beach resort in Cyprus with large swimming pool 5m x 10m overflow and WiFi available free of charge. This self-catering villa is situated in an idyllic location in the centre of Protaras, only a short stroll away from the famous beach at Fig Tree Bay and gold sand of Flamingo Bay. Built with high standards and offering all household facilities this villa is ideal for a relaxing getaway. Villa has a private swimming pool and spacious outdoors including built-in BBQ and outdoor shower and all necessary outdoor furniture for al fresco dining. The villa can comfortably accommodate 7 persons. On the first level is spacious and airy living area including sitting and dining areas and kitchen. There are also one single bedroom and guest toilet on this level. The second level has another two twin bedrooms which can share a family bathroom with bath as well as one en-suite master bedroom with stunning sea view. Perfect holiday and unforgettable moments are guaranteed choosing this excellent villa. All bedrooms are spacious with air-conditioning and wardrobes. The kitchen fully equipped with fridge/freezer, cooker, microwave, toaster, kettle, washing machine, dishwasher, ironing facilities, oven, extractor fan & all cooking utensils. Living room is cosy with satellite TV, DVD player. Dining table is for 6 people. The garden is fenced for privacy with a private swimming pool (5m x 10m / overflow) with sunbeds & umbrellas and outdoor shower. The villa is close to all amenities such as bars and pubs, banks, clothes shops, coffee shops, mini market, night clubs, pharmacy, restaurants, supermarket, Hairdresser, Beauty salons, fitness studio, Spa. There are lots of activities in Protaras like Scuba diving, Boat trips, Cycling, Fishing, Swimming, Water sports, Jeep safaris, Horse riding, and Rock climbing.